On first impression, sleep and sleep disorders may seem like they have nothing to do with eye disorders; however, the more we learn about sleep the more we discover surprising connections between sleep and different organs and systems and their disorders. For example, recent studies demonstrated a very close association between disorders of sleep and eye problems. 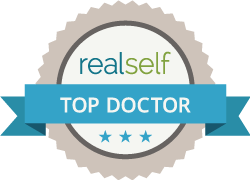 During the night while asleep, the most important metabolic, hormonal and immune functions are running, programming and reprogramming. Disorders of these programs affect all bodily systems. During the last decade, several new branches of sleep medicine were developed, such as Sleep Pulmonology, Sleep Cardiology, Sleep Psychiatry, Sleep Dentistry , and even Sleep Urology. Looks like this is a time for sleep medicine to “have eye contact” with eyes disorders. As a letter from Mayo Clinic stated: “Given the known physiologic consequences of sleep disorders, it is not surprising that important associations exist between ophthalmologic and sleep disorders”. Obstructive sleep apnea (OSA) is one of the most common and potentially life – threatening sleep disorders. It is defined as repetitive episodes of stop breathing for 10 and more seconds during sleep, causing significant decrease in airflow and a drop in oxygen desaturation. Apneas produce spasms and distensions of intraocular capillary, tissue perfusion problems and fluctuation of oxygen supply. OSA has been linked to primary glaucoma or normal-tension glaucoma, ischemic optic neuropathy (NAION), floppy eyelid syndrome, papilledema, and eye complications from continuous positive airway pressure (CPAP).. Now patients with OSA are strongly recommended to have eye examinations and patients with eye disorders to have a sleep evaluation. 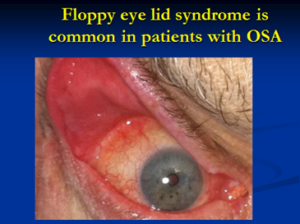 For example, such a strange eye disorder, called Floppy Eyelid syndrome (FES), is in about 96-100% associated with OSA. FES presents in middle-aged obese men with easily everted eyelids and pupillary conjunctivitis, eye watering, blurring of vision, and eye discomfort. Treatment includes eye lubricants and treatment of OSA. Another disorder associated with OSA is Nocturnal lagophthalmos, which is an inability to completely close the eyelids at night (sleep with open eyes), is manifest during sleep with symptoms such as eye pain, irritation, dryness, foreign body sensation, and increased watering. These eye-related symptoms may interrupt sleep with frequent arousals. Treatment includes avoidance of alcohol and sedatives; nocturnal use of natural, topical, or oral agents. Glaucoma is associated with OSA. 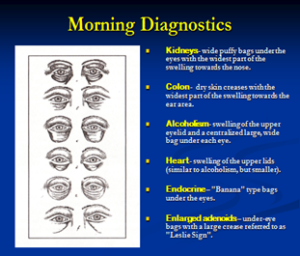 Risk factors include older age, genetic risk, thin cornea, and high intraocular pressure. The frequency of OSA in those with primary glaucoma or normal-tension glaucoma has been reported as 20% to 57% in case series. On the other hand, patients with OSA have glaucoma in 2% to 27% of cases. The use of CPAP for OSA also helps primary with glaucoma and normal-tension glaucoma. Alternative treatment to CPAP may be needed. Our facial features develop during sleep. Any severe disorders of sleep due to pregnancy or post-delivery problems as well as parental alcohol intake might significantly affect eye functions. 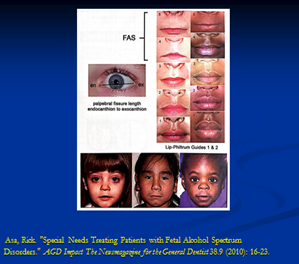 As an example are the faces of children with Fetal Alcohol Syndrome (FAS). 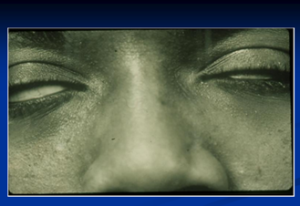 Depending on different conditions individuals can develop bags under their eyes as presented below.